There shouldn't be any shortage of motivation for the German this season. He'll be keen to prove that last season's success wasn't a one-off, and he's also within reach of Alain Prost's mark of 51 Grand Prix wins and four World Drivers Championship titles. Although Schumacher has given the first hints that his thoughts are now extending beyond his Formula One career, it's premature to assume that his pace or form will be affected just yet. For the first time in his career, he defends his title in a position of total stability and continuity. Jean Todt, Ross Brawn and Rory Byrne will provide their customary excellent support, teammate Rubens Barrichello is unlikely to intrude on his championship bid, and the F2001 is a continuation of last year's winning package. The re-emergence of Michelin is a potential fly in the ointment, and the success of Schumacher's season will depend largely on whether he and the designers can solve, or at least work around, the problem of tyre wear. After a learning season which yielded the Brazilian's maiden win, it seems that Barrichello has settled into his role as the de facto but unofficial 'number two' at Ferrari. During his tenure with Stewart, Barrichello showed a disturbing tendency to fade during the second half of the race. Whatever caused that problem, he eradicated it during his debut season at Ferrari, and the Hockenheim win was the deserved result of sustained race-long effort. It's highly unlikely that Barrichello could outrace Schumacher over the course of a full season, but the Brazilian will still be hopeful for a legitimate title shot. To this end, there are several points in his favour. He is competitive in all weather conditions, and the Ferrari is likely to be ultra-reliable again. If Schumacher falters early in the season and hands Barrichello a championship lead, it could boost the Brazilian's confidence and driving to the next level. In 2000, Hakkinen experienced all the pressure of being defending driver's champion. On top of that, he was also aiming to become the first driver since Fangio to win 3 WDC titles in a row. Ultimately it was his own mid-season form slump, as much as early season McLaren unreliability, that let him down. Like arch-rival Schumacher, Hakkinen is now a family man, although paternal duties are unlikely to dim either's focus and commitment to the coming season. Hakkinen has all the qualifying and race skills to match Schumacher in the championship battle, with two notable exceptions. Firstly, the MP4-16 appears to be as fast yet fragile as Newey's earlier McLaren designs, which must be disturbing news for both McLaren drivers. Secondly, Hakkinen must be praying that races will either be fully dry or fully wet. In changing conditions, the Finn is often too conservative and vulnerable to damp-track specialists like both Schumachers, Barrichello, and Alesi. 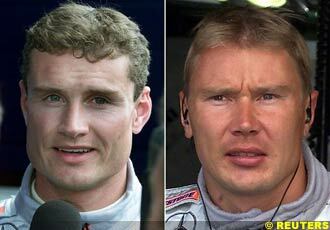 David Coulthard is another season threat. If the Scot manages to get the upper hand early on, Hakkinen could battle to regain momentum. He needs to dominate his teammate right from the start of the season. Some things never change in Formula One. One of those is David Coulthard's predilection for entering each new season fighting fit, raring to go and boldly declaring 'This is my year'. Having spent the bulk of his career in very competitive machinery, the Scot has little to show for it. That is partly circumstancial - Coulthard has always been paired with excellent teammates. Despite that, he's occasionally shown that he can compete with, and beat, the very best. Unfortunately, his great races are too few and far between, and usually at a time when the result has little impact on the championship. Over a full season, the Scot simply lacks the consistency to win the WDC. Perhaps it's a matter of confidence, for he always seems to be chasing the championship leader, and never setting the pace himself. If Fate conspired to hand him victory in the opening two races of the season, he may become a very difficult man to beat. 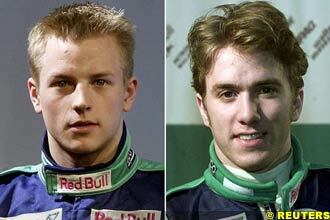 Formula One has been nothing if not challenging for the younger Schumacher sibling. He's never had an easy teammate, being paired with fast and talented rookies (Fisichella and Button), an experienced WDC in Damon Hill, and promising CART champs in Alex Zanardi and now Juan Pablo Montoya. If anybody in F1 has raced his own teammate each season, rather than the rest of the field, it's Ralf Schumacher. Yet he's gone about the business with great professionalism, accumulating worthy results in his quiet, earnest and circumspect manner. Schumacher is comfortable in all weather conditions, and has earned a reputation as a reliable driver who can usually be trusted to get the best result from the car. Williams are likely to be more competitive than last season, and much will be expected from Schumacher. There is already an atmosphere of open rivalry between himself and new signing Montoya. 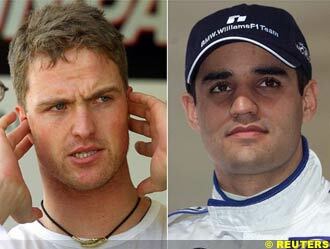 Many F1 observers consider that Montoya and Button will be the automatic Williams choices for 2003. Schumacher must use this season to prove them wrong. The flamboyant Colombian is doubtless the most exciting and talked-about new arrival in the 2001 F1 season. But, as Alex Zanardi will attest, pre-season hype doesn't get the job done. Expectations for Montoya are high, probably way too high. Jenson Button did him no favours, by showing that a rookie could outqualify and occasionally outrace a seasoned pro like Ralf Schumacher. Montoya has willingly taken up the cudgels, and both Sir Frank Williams and Patrick Head are expecting fireworks between their two drivers this season. Whatever the outcome, it will be a stern test of Montoya's skill behind the wheel, as well as his temperament and ability to manage off-track relationships. Time is running out for the diminutive Italian. Despite showing loads of precocious talent, he's been unable to land a top drive. And, with each passing season, his chances dwindle further. Just two short seasons ago, he was viewed as one of F1's hottest young properties. In 2001, he finds himself in the position of seasoned veteran, defending his reputation against the next generation of rising stars, specifically new teammate Jenson Button. Fisichella should have the speed and smarts to lead Button until the season's halfway mark. Traditionally, that is where the Italian's problems start. He is ritually less competitive during the second half of any given season. Whether that loss of form is physical, mental, emotional, or linked in some way to the team's modus operandi, Fisichella has to find a solution this year. With Renault funding and technology, the Benetton can only get better. It would be the ultimate irony if Fisichella was released just as the car became dominant. Button's disarmingly straightforward and simple approach to learning Formula One turned his debut 2000 season into a dream, and made him a legitimate superstar-in-waiting. Sir Frank Williams and Patrick Head have never been the most sympathetic employers, yet Button's performance and approach at Williams drew nothing but praise from the two. 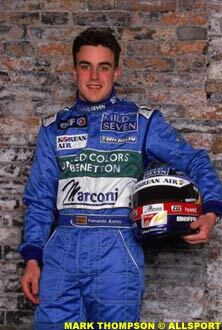 If anything, Flavio Briatore's Benetton outfit is even tougher on drivers. Yet, such is Button's composure that he seems able to tackle any situation and still produce the goods. Although even he may find that the second season in F1 can be a lot tougher than the first. Expectations are far higher, and any mistakes on his part will inevitably be analysed and publicised beyond their real-world significance. 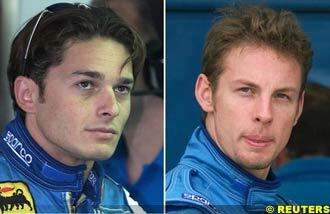 Button has already adopted the smooth and unhurried style of a driver with ten times his experience. The style works, and he'll do well not to tinker with it. If he can pick up where he left off in 2000, the sky's the limit. Panis early promise was ruined by a succession of mediocre cars and a high-speed accident which broke both his legs. In 2001, he gets a second shot at stardom, albeit in a team built around the needs and ambitions of star driver Jacques Villeneuve. Panis brings to BAR a wealth of setup and development smarts, honed by his recent testing work for McLaren. If the break from competitive F1 driving redoubled Panis desire to win, now is his time to show it. However, given the machinery and team ethic around him, it'll be an uphill struggle. Like his 1997 WDC rival Michael Schumacher, Villeneuve enjoys the luxury of racing for a team custom-built around his needs. Unlike Schumacher, Villeneuve has enjoyed zero success with such a team. Not only is the BAR trophy cabinet bare, it's probably been sealed and placed in storage. F1 commentators have notoriously short memories, and Villeneuve's continued lack of success makes it harder with each passing season to rationalise his place among the current generation's elite drivers. Like his father Gilles, Jacques entered F1 in a competitive car, only to see the prime years of his career slip away in less impressive machinery. His frustration with BAR's relative lack of progress is evident. Villeneuve is first and foremost a fearless racer, and frustration and fearlessness do not make good bedfellows. Judging by current testing times, this year's BAR is no more competitive than last season's car. 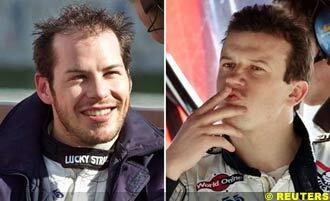 Villeneuve's best chance of a good result is to drive patiently, and survive during races of attrition. It remains to be seen whether Villeneuve can temper his natural aggression with the necessary patience. If not, he could find himself outpointed by teammate Panis come season's end. The big question about his season is which Frentzen will turn up - the listless uninspired driver of the Williams days, or the astute and measured Frentzen who came within one mysterious electronic failure of seriously contesting the 1999 WDC. Frentzen is an enigma, whose results appear to rely entirely on his mood. If he's happy and the car is performing well, he could win races. If the car doesn't please him, he'll vanish anonymously into the midfield. 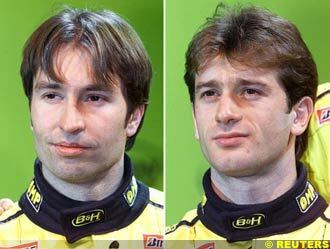 Frentzen is the antithesis of Villeneuve. He rejects robust wheel-to-wheel racing in favour of tactical racing - being on track with the right tyres and right fuel load when others aren't. It's enough to secure the occasional win, but nothing more. On at least two occasions in the past couple of seasons, Frentzen almost drove off the road in his willingness to allow a charging Mika Hakkinen through. If he was being lapped, fair enough. But he was supposedly racing for position at the time. With a young charger like Trulli in the other Jordan, Frentzen needs to toughen up and make challengers earn track position. The Italian must have been bitterly disappointed with his 2000 season. For the first time in his career, he had a competitive car, only to see it expire by the roadside more often than not. Although Trulli has tempered his youthful aggression, he's still involved in too many shunts. Twice last year he tangled with Jenson Button, setting the tone for a rivalry which could continue for years. With the Honda works engine, Jordan have upped the ante. If the car is anything like as reliable as the 1999 version, then Jordan should challenge for at least third in the Constructors Championship. With a moody and unpredictable teammate, Trulli has the ability and experience to become the lead driver for Jordan, provided he can keep the car in one piece. The Arrows was one of the surprise packages of 2000, allowing both Verstappen and De La Rosa to turn in some impressive performances. True to his much-maligned reputation, Verstappen did get involved in several spins and shunts. But it was the fragility of the Arrows chassis, rather than driver error, which was usually to blame. The 2001 car is likely to be an entirely different proposition. The extensive reworking of the design, in combination with the Asiatech engine, will probably rob the car of some straight-line speed in favour of greater grip. Verstappen's best chance of a good showing is in the rain, and he must maximise any high-attrition opportunities too. At 28, Verstappen is one of the most experienced drivers in the field. After a journeyman career, he has few chances left to impress the major teams. After Juan Pablo Montoya, Brazilian Bernoldi will probably have the greatest chance to impress among the 2001 debutants. Even at only 22, former karting star Bernoldi has enough experience, both in the junior formulae and as a test driver, to make the transition to F1 comfortably. He has an experienced but not intimidating teammate, and the Arrows should be more competitive than several of the tailend teams. Bernoldi can't expect to score championship points, but occasionally outqualifying and/or outracing his vastly-experienced teammate would be a plus on his CV. Anything more would be a bonus. Ostensibly, with the prospect of a future seat at McLaren, Nick Heidfeld entered F1 with the proverbial silver spoon jammed in his gullet. 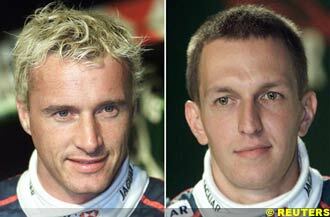 Even so, one couldn't help but feel empathy for the German's nightmare debut season for Prost in 2000. To add to the litany of shattered Peugeot engines, Heidfeld also had to contend with the unwelcome attention of two highly-publicised shunts with teammate Alesi. If greatness arises from conflict, then Nick Heidfeld certainly prequalifies. Having spent a full season around the vast experience of Alesi and team owner Alain Prost, Heidfeld should have picked up some priceless tips on the F1 business. This season, he'll need all that knowledge, and then some. With just one F1 season under his belt, Heidfeld finds himself in the unlikely position of Sauber senior driver and team leader. On the plus side, the team's year-old Ferrari engines are tried, tested and reliable performers. The downside is that Sauber's performance invariably falls away in the second half of the season, due to lack of development. Heidfeld needs to learn the car quickly, and maximise any chances he gets during the first half of the season. If he can do that, it will be a giant step in securing a longer-term McLaren-Mercedes drive. Many F1 observers consider that entry into the sport is too easy for today's drivers. Button's premature arrival in F1 last year caused controversy, and Raikkonen's signing has too. At just 21, and with Formula Renault as his primary single-seater racing experience, the Finn has further challenged the perception that F3000 experience, or better, is a F1 prerequisite. Button's form during his debut season silenced a lot of critics, but the Englishman had several advantages over Raikkonen. He was paired with an experienced racer in Ralf Schumacher, and also had the support of Williams, the best engineers in pitlane. Raikkonen has been pitched in at the deep end, and many will expect or even want him to fail. Finns have established a reputation as solid implacable racers. Raikkonen will need those traits in abundance. For the outspoken Irishman, the near-triumph of 1999 must seem like a distant memory. With the departure of Johnny Herbert, Jaguar's hopes now rest squarely on Irvine's shoulders. The continued woeful form of the car hasn't been helped by Irvine's public criticisms and scathing disdain for run of the mill testing duties. Add in his war of words with newly-appointed team consultant Niki Lauda, and both Jaguar's and Irvine's prospects for the coming season look bleak. Jaguar have more than enough funding and expertise to turn their fortunes around, but Irvine has to give full support to that effort. 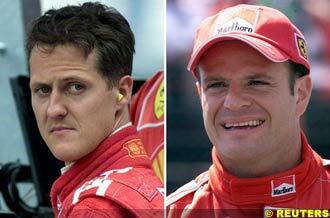 In 1999, he showed maturity and consistency in keeping Ferrari's hopes alive after Schumacher's Silverstone accident. Several times last season, he also placed the Jaguar higher up the order than it should have been. Consistency will be the key to his season. If that's augmented by the occasional flash of brilliance, so much the better. If the conflict between teammate Irvine and team consultant Lauda escalates, Luciano Burti might be forgiven for thinking he's in a war zone rather than a Formula One team. During the 2001 season, the young Brazilian may end up learning more about political in-fighting than actual competitive F1 driving. Whatever happens, Burti must steer clear of conflicts within the team, become his own driver, and race his own season. With only one GP start to his credit, that will be a tall order. Fortunately, he's not totally new to the team, and there are no expectations to fulfil. Simply finishing races with other cars behind him could be enough to secure his short-term future in F1. At a tender 19, the Spanish newcomer is the only driver in the field whom Jenson Button can call 'junior'. Like Raikkonen, Alonso has experienced a meteoric rise to the rarefied atmosphere of F1, although Alonso at least has a F3000 season under his belt. Alonso is under the least pressure of all the 2001 debutants - Minardi drivers are expected to be lapped on a regular basis. Minardi are also a 'rookie-friendly' team, where Alonso can set about the steep F1 learning curve in a supportive and essentially cheery environment. Although new owner Paul Stoddart has set stiff deadlines for the expected stages of progression, nobody expects Minardi's performance to improve this year. Alonso's approach to the season may be influenced by the team's eventual choice of a second driver. If it is a seasoned veteran like Gianni Morbidelli, Alonso's workload will be lightened, and he can concentrate on improving himself rather than the car. If Minardi eventually elect to go with another newcomer, Alonso's first season could be a lot more stressful. The arrival of the year-old Ferrari engines has been good news for the mercurial Alesi, and he's responded with some impressive testing times. The French outfit aren't out of the woods by a long way yet, but they can expect a vast improvement over last year's dismal showing. Alesi is comfortably the oldest and most experienced driver currently in F1. He must surely have abandoned all hopes of securing another top drive, and races on in the belief that Prost can produce a car worthy of his talents. Unlike most of the other drivers, Alesi is no longer building a career. He no longer needs to race conservatively, nor to impress team owners with his driving. This season, Alesi can go for broke and approach each race as though it were his last. If the Prost car can take the strain, the French-Sicilian elder statesman of F1 might conjure up some surprise results. After a mildly satisfactory first season with happy-go-lucky Minardi, Mazzacane must expect a quantum-shift in commitment and competitiveness at Prost. Fortunately, he's joining the team at the right time. With the dismal Peugeot engines replaced by the ever-reliable Ferrari powerplants, team owner Alain Prost may have more time this season to spend on his drivers, rather than sorting out technical problems. For Mazzacane, the chance to work under 'The Professor' is a rare and golden opportunity. Prost is a past master at setups, development and the art of winning as slowly as possible. Those are tools which can turn a good talent into a great one, and Mazzacane will learn as much in the pits as he will on track. 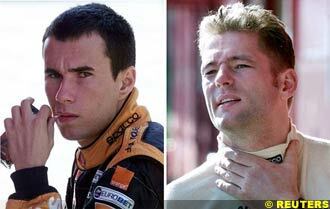 Mazzacane can also learn from Alesi, although it'd be foolish to try and emulate his team leader's unique style. 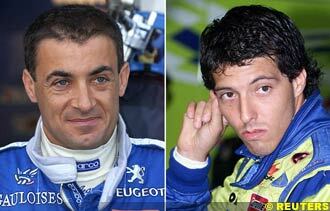 The whole Prost outfit is hungry for success, but they will also be looking only to Alesi to provide results. If Mazzacane uses this season well, he will emerge a faster and better driver at the end of it.